We are proud to announce a new major release of Meliora Testlab: Oakville Blob. A major feature included is a Rest-based API for your integration needs. In addition, this release includes numerous enhancements and fixes. Read on. pushing externally run testing results as test runs. We publish the API endpoints with Swagger, a live documentation tool, which enables you to make actual calls against the data of your Testlab installation with your browser. You can access this documentation today by selecting the “Rest API …” from the Help menu in your Testlab. You can also read more about the API from the corresponding documentation page. When commenting assets in your project such as issues or test cases, you can now tag users from your project to your comments. Just include the ID, e-mail address or name of the team member prefixed with @ character and this user automatically gets a notification about the comment. The notice scheme rules have also been updated to make it possible to send e-mail notifications for users who are tagged to the comments of assets. Also, a new out-of-box notice scheme “Commenting scheme” has been added for this. See the attached video for an example how this feature works. Sometimes it is beneficial to go through the results of earlier times of execution for a test case. To make this as easy as possible, Test design view has been added with a new “Execution history” tab. 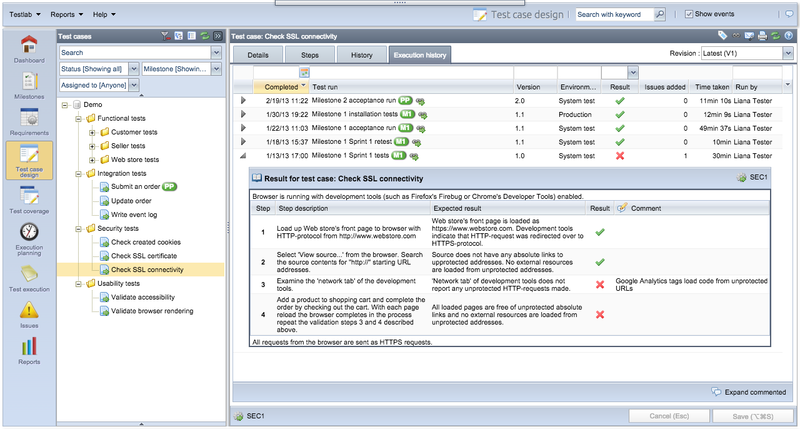 This new view lists all times the chosen test case has been executed with the details similar to the listing of test run’s items in Test execution view. Each result can be expanded to show the detailed results of each step. detailed documentation for all notification types has been added to the help manual. if a step of test which you have been assigned with is added with a comment during testing, you will be notified. searching with “requirement.name:something” searches “something” from the names of requirements. For a complete listing of possible targeting prefixes, see Testlab’s help manual. Several usability related changes have been implemented. Easy access to test case step’s comments: Test execution view has been added with a new “Expand commented” button. By clicking this button the view expands all test run’s test cases which have been added with step related comments. Rich text editing: The rich test editors of Testlab have been upgraded to a new major version of the editor with simpler and clearer UI. Commenting: keyboard shortcuts have been added for saving, canceling and adding a new comment (where applicable). Step editing: Step editor used to edit the steps of a test case has been added with proper keyboard shortcuts for navigating and inserting new steps. Test case coverage has been added with a new column: “Covered requirements”. This column sums up and provides access to all covered requirements of listed test cases. Test run selector has been changed to an auto-complete field for easier use with lot of runs. Several reporting engine related changes have been implemented. Hidden fields in report configuration: When configuring reports, fields configured as hidden are not anymore shown in the selectors listing project’s fields. Better color scheme: The colors rendered for some fields of assets are changed to make them more distinct from each other. Test run’s details: When test runs are shown on reports, they are now always shown with the test run’s title, milestone, version and environment included. Wrapped graph titles: When graphs on reports are rendered with very long titles, the titles are now wrapped on multiple lines. Results of run tests report: The report now sums up the time taken to execute the tests. 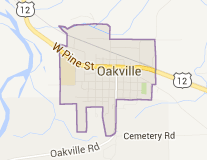 Test case listing report: Created by field has been added. With the enhancements listed above, this feature release contains numerous smaller enhancements. New custom field type – Unique ID: A new custom field type has been added which can be used to show an unique non-editable numerical identifier for the asset. Editing of test case step’s comments: The step related comments entered during the testing can now be edited from the Test execution view. This access is granted to users with “testrun.run” permission. Confluence plugin: Listed assets can now be filtered with tags and, test case listing macro has an option to filter out empty test categories. Test run titles made unique: Testlab now prevents you from creating a test run with a title which is already present if the milestone, version and environment for these runs are the same. Also, when test runs are presented in the UI, they are now always shown with this information (milestone, version, …) included. “Assigned to” tree filter: The formerly “Assigned to me” checkbox typed filter in the trees has been changed to a select list which allows you to filter in assets assigned to other users too. File attachment management during testing: Controls have been added to add and remove attachments of the test case during testing. Dynamic change project -menu: The Change project -selection in Testlab-menu is now dynamic – if a new project is added for you, the project will be visible in this menu right away. Permission aware events: When (the upper right corner floating) events are shown to users, the events are filtered against the set of user’s permissions. Now the users should be shown only with events they should be interested in. Number of filtered test runs: The list of test runs in Test execution view now shows the number of runs filtered in. UI framework: The underlying UI framework has been upgraded to a new major version with many rendering fixes for different browsers.